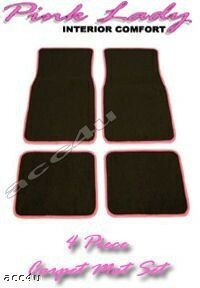 4 Piece Carpet Mat set with non slip backing. Black quality mat with Pink bound edges. Please note that these mats are classed as universal fit and therefor no exact application or suitability guide is available. 15" SW Blue Ring Black Car Wheel Trims Covers & Free !! !